Preheat oil in Presto® electric deep fryer. If using an adjustable thermostat deep fryer, set at 375°. In medium bowl, mix together flour, sugar, baking powder and salt. In a second bowl, whisk together milk, brandy, egg yolk, and melted butter. Gradually stir into dry ingredients until smooth. Set aside. Mix together cinnamon and sugar. Sprinkle over both sides of apple slices, saving remainder to dust over finished fritters. Sprinkle slices lightly with nutmeg. In clean bowl, beat egg whites until stiff, but not dry. Fold into reserved batter. 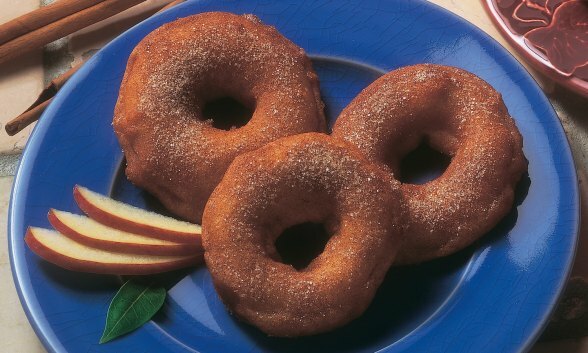 Dip several apple slices into batter to coat evenly, letting excess drip off. Carefully place 1 to 2 slices at a time into hot oil. Cook 3 to 4 minutes, turning once. Drain on paper towels. Sprinkle both sides with reserved cinnamon and sugar mixture. Best served warm. Do not use frying basket with this recipe.